This dish is perfectly balanced between hot and cold, sweet and salty, creamy and crunchy, bright and mellow. 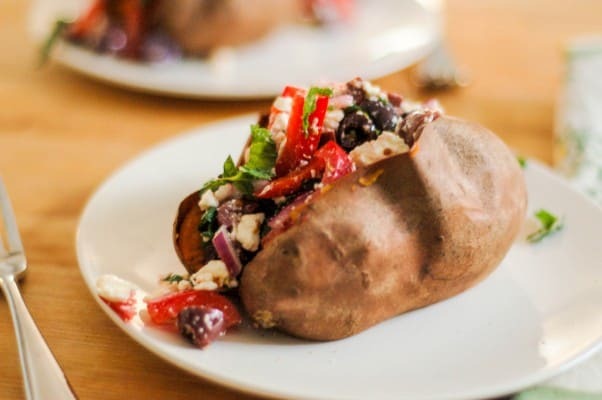 It’s a spin on a stuffed baked potato, but this time it’s a sweet potato and the filling takes a turn for the Mediterranean with salty olives and tangy feta and crunchy sweet bell peppers and red onion all drizzled with olive oil and sprinkled with mint. It’s a dish I used to make all the time, but had somehow sort of forgotten about as I took on new cooking projects. I was reminded of it when I was leafing through some of the older residents of my cookbook shelves, looking for inspiration and little gems on their pages I might previously have overlooked. When I saw this recipe when I was flipping through Diana Henry’s wonderfully titled cookbook Crazy Water Pickled Lemons, I remembered just how much I loved it and knew I had to make it right away. It’s a dish that feels perfect for the cusp of spring. 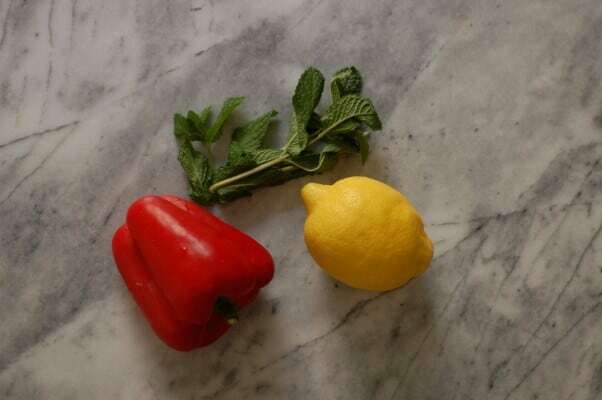 It relies on produce that is easily findable in winter, but manages to combine them in surprising ways that wake up the palate and feel fresh and new. And it uses so many colors that it’s a feast for the eyes as well. And it could barely be easier. 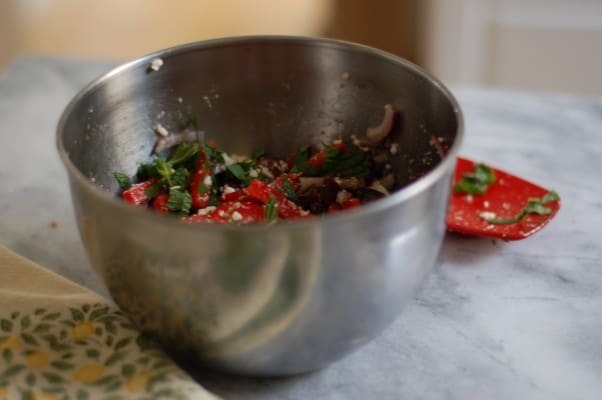 You throw the sweet potatoes in the oven to bake for about an hour, and while they’re roasting, you chop some olives, some red pepper, some red onion, some mint. You squeeze some lemon, crumble some feta, toast some spices, toss it all together in a bowl and drizzle in some olive oil and let everything marinate while the sweet potatoes finish baking. Then, when the sweet potatoes come out of the oven, you split them open and pile in the minty marinated feta-olive-red-pepper mixture and viola, you’ve got a meal. 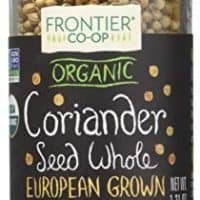 Or I suppose it could also make a pretty spectacular side dish, if you’re the organized, fancy sort of person whose meals tend to include main dishes and side dishes. Looking for more sweet potato inspiration? Give these curried sweet potato latkes a try. I love this dish so much. 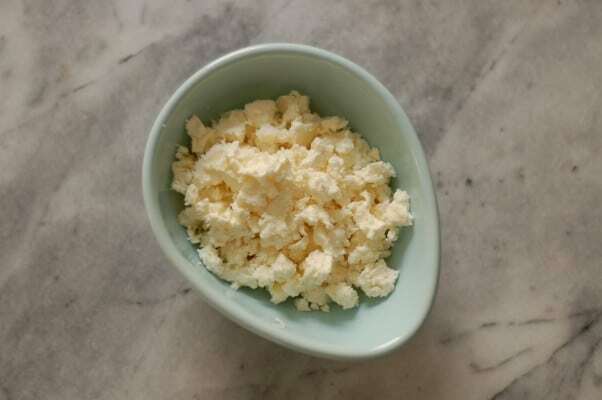 It combines familiar flavors in an unexpected way and the combination just works. 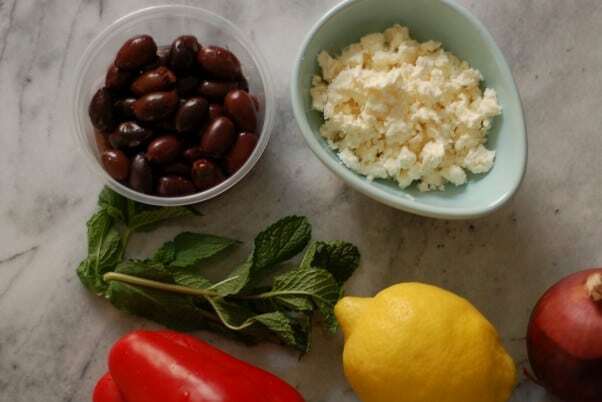 If you’re an olive hater, you can leave them out and still have a great dish. The amounts here are pretty flexible given the variable sizes of sweet potatoes. I try to look for ones that are on the medium-small side rather than the huge ones that so often populate the grocery store islands. 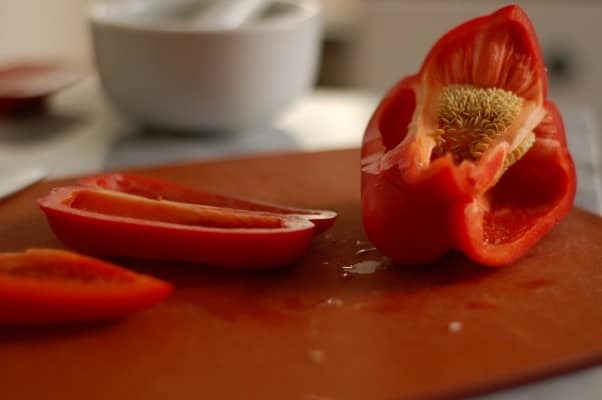 If all you can find are huge ones, you can certainly cut them in half after roasting and pile the feta-olive-red pepper mixture on top. Preheat oven to 375° F. Line a baking sheet with aluminum foil. 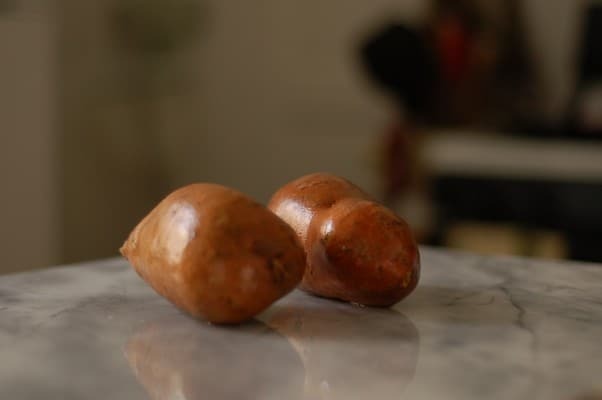 Scrub the sweet potatoes under cold water to remove any stray dirt, place them on the foil lined baking sheet (no need to x or prick the skin) and bake for 45-60 minutes (depending on size) until they feel tender to the touch. 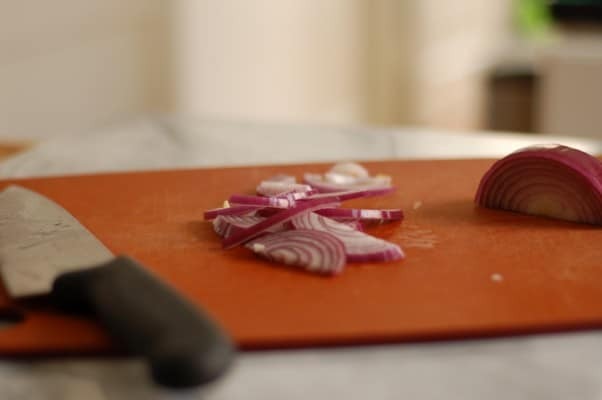 While the potatoes are baking, add the chopped red onion to a medium bowl and pour the lemon juice over it and let it sit for a few minutes. 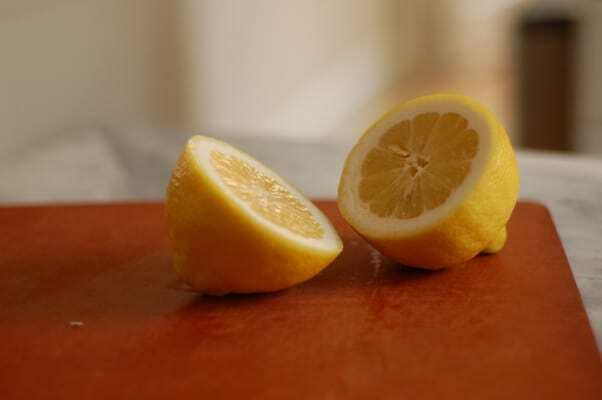 This will help to take the bite out of the raw onion. 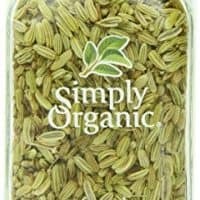 Toast the fennel and coriander seeds in a dry skillet over medium heat for about 1 minute, or until fragrant. 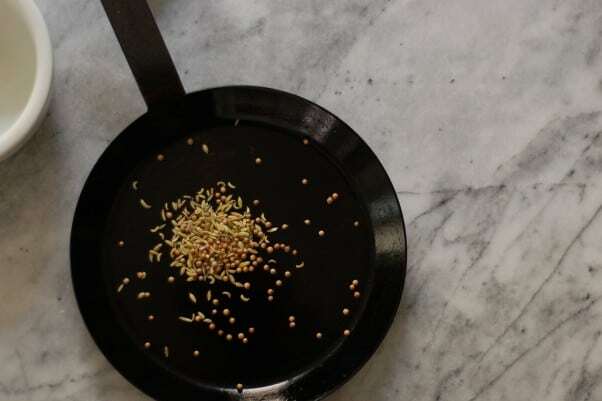 Crush the seeds in a mortar and pestle and add them to the bowl. 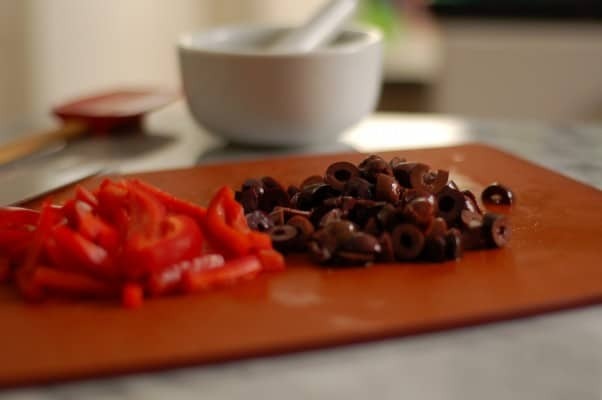 Add the olives, bell pepper, mint and olive oil to the bowl and stir to combine. Cover and refrigerate until the sweet potatoes are finished baking. 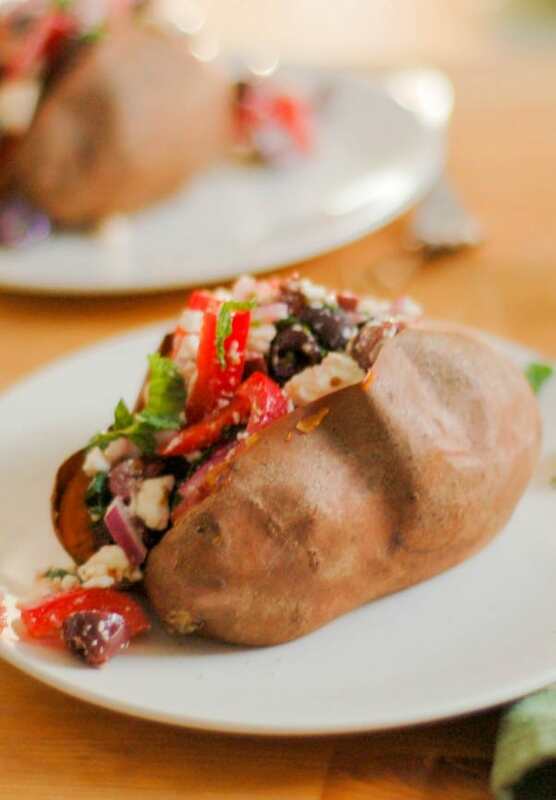 When the sweet potatoes come out of the oven, put them on plates, slice them open lengthwise, and divide the feta-olive-red pepper mixture between them. Eat. Mmmm, I love potatos, quite possibly one of my favorite foods, I love this twist on the baked potato, pinned! Thanks, Sara! I love potatoes and sweet potatoes too. This gives me another excuse to enjoy them. I love stuffed sweet potatoes, this is a great idea! Thanks! I love the mix of textures and flavors in this one. This is my kind of sweet potato Looks and sounds delicious. Pinning for later. Thanks, Lyndsay! It’s a good one. This looks delicious! I bet this would do really well in the fridge overnight for quick lunches. Thanks, Kathryn! If I were keeping this in the fridge overnight, I’d store the topping and the sweet potato separately, so I could heat up the sweet potato and then add the topping, but, yes, it would make a great lunch. I love regular baked potatoes and but have never made baked sweet potatoes before! YUM! I love baked sweet potatoes (like I love sweet potato fries). You should totally try them! Oooh this sounds SO tasty… thank you for sharing! I’ve never heard about sweet potatoes, but I will give it a try to this recipe. I love potatoes and I bet this tastes so good. Thanks, Daniela! I hope you give it a try! Each one of these ingredients is my favorite. Would love to try this recipe one of these days! These sound AMAZING! Super simple and with all of my favorite flavors in one place. Can’t wait to give them a try! Thanks, Les! Let me know how it turns out. oh wow… I’m trying it this week! I hate cooking and I’m not creative at it, but this is easy and it looks beautiful! It is easy. Let me know how it turns out.